The number of beef-sired calves registered in the first half of the year was back 2.3%, according to Quality Meat Scotland (QMS). Analysis by the red meat levy body reveals the total number of calves registered between January and June this year was back 1.6%, with dairy-sired calf registrations up 3.9%. “Compared to their five-year average for the January-to-June period of 2014-18, total numbers were down 0.7% with beef numbers falling 0.4% and dairy numbers by 2.7%,” said QMS senior economics analyst, Iain Macdonald. He said the dairy market downturn in 2015 had resulted in a significant drop in dairy-sired registrations, coupled with an increase in beef-sired registrations in dairying areas. However, the most significant trend identified in calf registration figures was the shift from continental cattle to native breeds, said Mr Macdonald. “Back in 2013 the three main continental breeds – Limousin, Charolais and Simmental – collectively accounted for 65.4% of the beef-sired registrations, but by 2018 this had dropped back to 57.8%,” he added. He said native breeds had experienced a significant rise in popularity due, in part, to the premium offered by processors and retailers for some breeds. 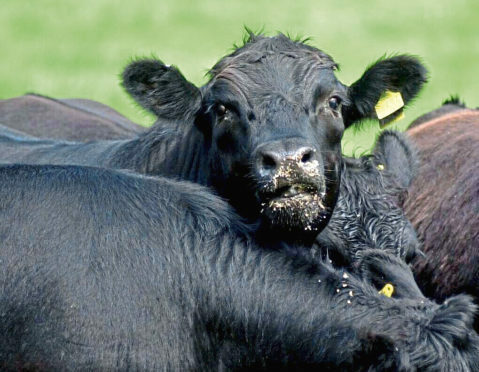 “For example, Aberdeen-Angus went from a 19% share of beef-sired registrations in the first half of 2013 up to 21.6% this year,” said Mr Macdonald. Other breeds experiencing a rise in popularity include Salers and British Blue with registrations increasing between 2013 and 2018 from 1.9% to 2.8% for Salers, and from 3.1% to 3.9% for British Blue. “With the birth-to-beef production cycle averaging two years, calf registrations can provide a leading indicator of beef supplies,” said Mr Macdonald. Looking ahead to the rest of this year, Mr Macdonald predicted a 1.5% increase in the availability of Scottish-born beef-sired animals ready for slaughter.However the number of prime animals reaching Scottish abattoirs will also depend on cross-border movements. “Data from BCMS shows that during 2017, Scottish abattoirs handled 336,000 Scottish-born cattle aged less than 30 months. Compared with five years before, this was a fall of 1.6%,” said Mr Macdonald.